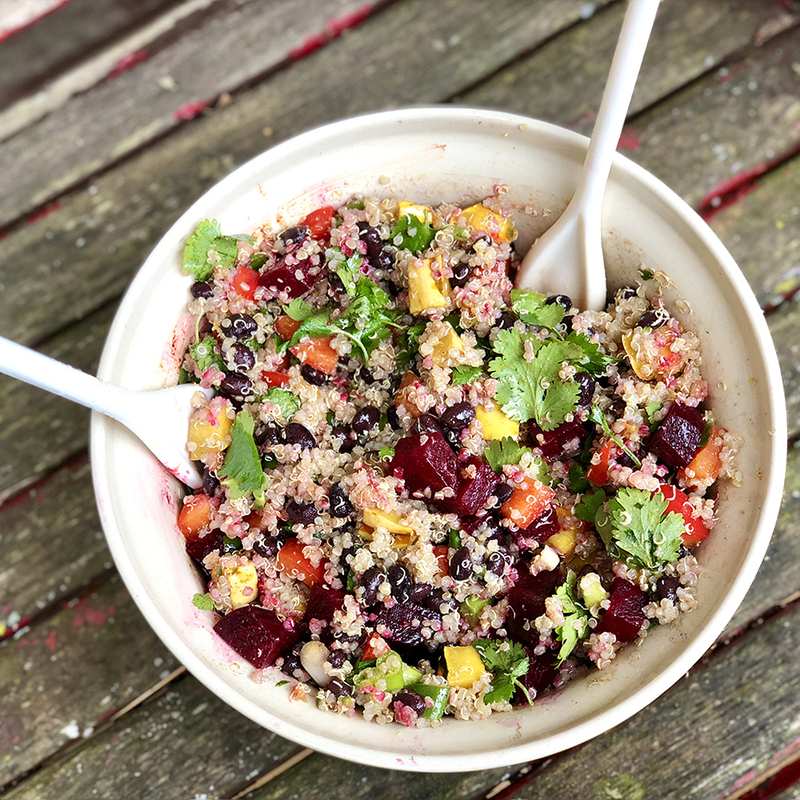 Beets and squash and quinoa, oh my! 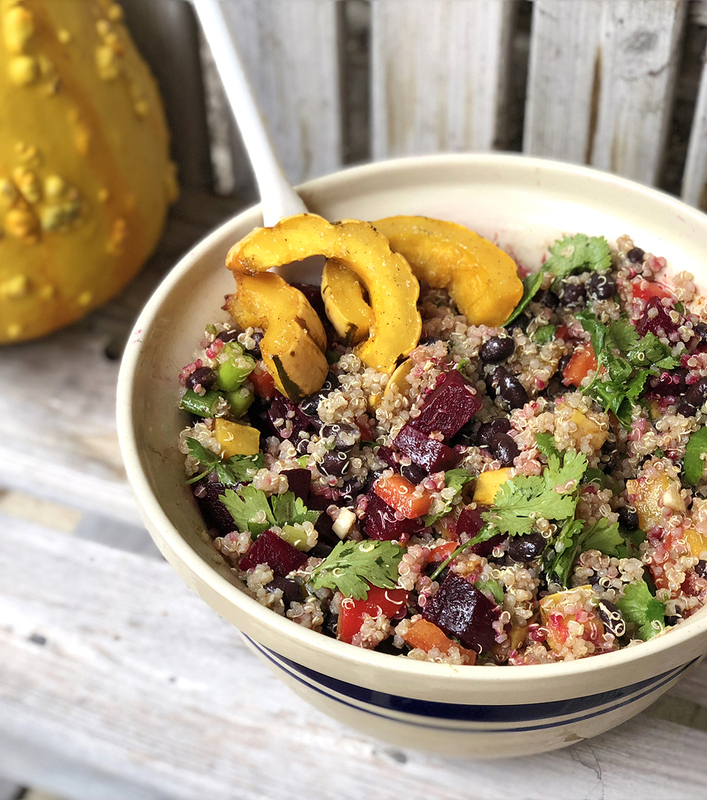 Roasted delicata squash and red beets are perfectly paired with quinoa in this nutritious, colorful, and flavorful salad. Are you a fan of Delicata Squash? We are obsessed! Delicata squash, known for its delicate edible rind, is a scrumptious seasonal squash similar to butternut squash. Its beautiful vibrant color, deliciously tender skin, and subtle pumpkin-pie flavor makes this squash perfect for roasting and adding to salads or even fried like onion rings. Plus - squash is super duper healthy for you! Low in calories (if you are a calorie cruncher) and high in nutrition, delicata squash is worth adding to your grocery list. Delicata squash is filled with Vitamins A and C! Why are these vitamins important? Vitamin A plays a crucial role in promoting healthy eyes, teeth, and skin. Vitamin C is also important for health, especially as this vitamin helps heal wounds, boost immunity, and increase iron metabolism. In addition to the amazing nutrients from delicata squash, the beautiful beetroot also contains numerous trace minerals, vitamins, fiber, and superhero antioxidants. Beetroot health benefits include: boosting immunity, improving cardiovascular function, lowering blood pressure, increasing cognitive function, detoxifying liver and colon, and promoting healthy blood cells. Beetroot is also a folate rock star, perfect for pregnant and nursing mothers! Folate (Vitamin B9) contributes to a healthy nervous system, synthesis of red blood cells, DNA and RNA. 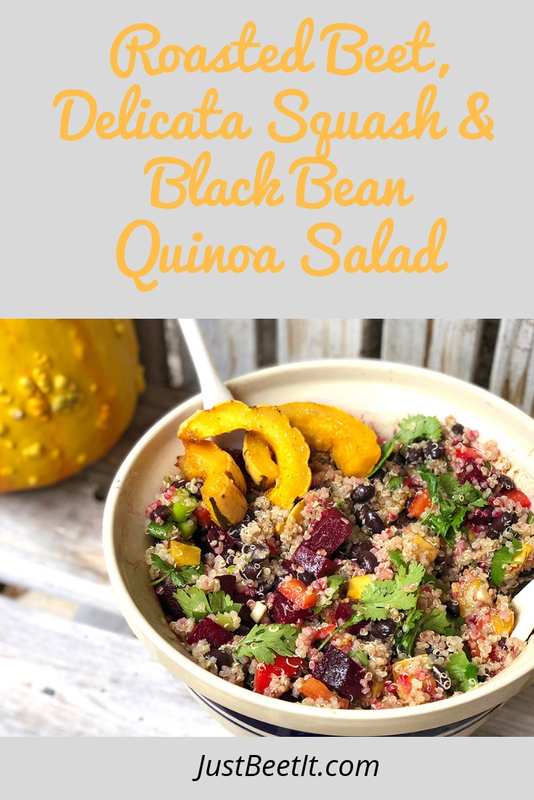 Besides the beautiful beet and vibrant delicata squash, quinoa is another nutrient-dense food and a great source of plant-based protein, fiber, vitamins, and numerous trace minerals. Slightly crunchy and nutty and filled with vast nutrition, this superhero seed (quinoa is usually prepared as a grain, but it’s actually a seed) is quite versatile. It’s often served as salads (both warm and cold), used to thicken soups, and makes a delicious breakfast porridge. Sure the salad may be nutritious, but what about the flavor? This salad will not disappoint! The lime, garlic, and slightly spicy (jalapeno) dressing is certainly savory not to mention the bell pepper, green onions, and cilantro mixed into the salad for extra vibrant and bold flavors. Add this salad to your meals as a delightful plant-based powerhouse of nutrition and taste! Roasted Beet, Delicata Squash, and Black Bean Quinoa Salad can be served cold or warm. If you opt for a warm dish, saute peppers and onion and serve immediately after quinoa and roasted squash and beets are cooked and slightly cooled. What are your favorite ways to prepare squash? Comment below. * Delicata squash is ideal for this recipe as the delicate thin skin allows easy prep for cooking AND you can eat the skins too! If you cannot find delicata squash (Trader Joe’s, Whole Foods, Fresh Thyme, and other grocery stores typically carry a variety of squash during Fall and Winter), substitute butternut squash or your favorite variety. Cook, cool, remove skin, and cube or slice. Add preferred squash to salad in place of delicata squash. Preheat oven to 400° F. Slice squash in half and place in a shallow baking pan. Drizzle with 1 tbsp olive oil. Sprinkle with 1/4 tsp salt and 1/4 tsp black pepper. Roast 10 minutes; turn over. Roast another 10 minutes or until tender. Remove squash and set aside until cool enough to handle. Cut squash in pieces. While roasting delicata squash, roast the beets. Gently rinse beets and trim off stems and leafy tops (save for a delicious sauteed beet greens appetizer or pickled-stems side-dish). Wrap each beet loosely in aluminum foil and place in the middle of oven. Roast beets until tender and easily pierced with the tip of a knife, about 30 minutes (Roasting time may vary based on size of beetroot). Click here for more tips on roasting beets. In a small food processor add lime juice, garlic, jalapeno, olive oil, and a dash of salt and pepper. No food processor? No problem! Finely mince garlic and jalapeno (remove all seeds) and whisk all ingredients in a small bowl. In medium-large salad bowl, add the following ingredients and gently mix well: cooked (cooled) quinoa, chopped red bell pepper, chopped green onions, chopped cilantro, black beans (drained well), smoked paprika, cumin, sunflower seeds (optional), olive oil, and cubed or sliced delicata squash. Add the dressing to the quinoa mixture; stir well. Serve immediately (warm or cold) and store in an airtight container in the fridge for up to 3 days.